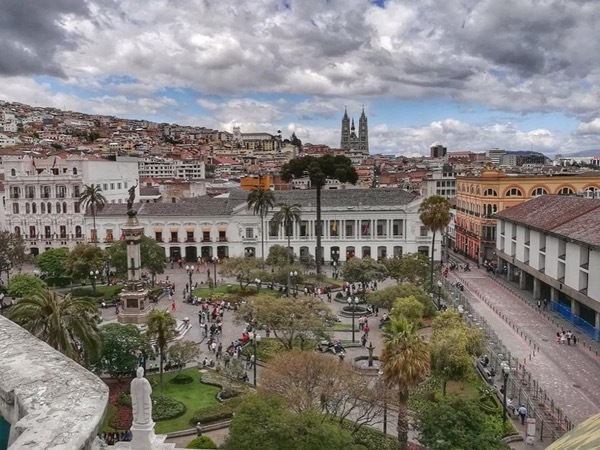 Traveler Reviews for Private Tour in Quito, Ecuador by Tour Guide David G.
About David G. Message David G.
David is an excellent guide!! He is locally raised, knows the area very well, and is well educated on the history of Ecuador. There were two in our party, his car was clean and comfortable, he speaks English very well, and of course his native Spanish. As US citizens and our first trip to Ecuador - we were so thankful we had this tour early in our trip, to give us a broad overview of Quito, the 'Center of the World', and Ecuador history/topography. His advice was very practical & I'd recommend David. David provides us with an outstanding tour which exceeded our expectations. He is very knowledgeable about his country and is enthusiastic about sharing his knowledge. He has excellent English language skills. We enjoyed every stop, especially the museum at Latitude 0.00'00, where we were amazed and surprised at the hands on experiments related to its unique location directly on the Equator. The historical old Quito was the highlight of the day, with its beautiful colonial buildings. David was great. A great day hearing about and seeing the local history. The visit to the equator was outstanding! David was an outstanding tour guide, I'm very glad I booked this tour with him! He was very knowledgeable about his country's history, economics, politics and it's people. If I were to visit Ecuador again, I would definitely do another tour with David. Chose David based on reviews and fluency in English. We were not disappointed. David is a very competent, knowledgeable, personable, and enthusiastic guide. His knowledge of history, geography, culture, flora and fauna is extraordinary. He assessed our preferences and selected great restaurants for our lunch stops. And, as advertised, his command of English is fabulous. Everyone in our group was absolutely delighted with David. We spend a day with David in Quito and the Equator line. Great program and all we could ask for. David is a pleasure to be around, great personality and knowledge. We would love to travel with him again and gives him our best recommendations. My husband and I spent a delightful day visiting Quito with David yesterday. David made learning about the city and his wonderful country a lot of fun. He is extremely knowledgeable in a variety of subjects, like history, current events, geography. He shares many anecdotes and stories that made the day very engaging, but most importantly, he is nice to be around. He was flexible with schedule and he tailored the visit to our specific interests. His English is outstanding. I strongly recommend David. David was most helpful in providing a well rounded tour of Downtown Quito and surrounding environs. He adjusted to our requests and was very knowledgeable of the history, culture and habitats of the area. I would recommend David to anyone in the area. David was extremely accommodating in customizing a Quito day tour based on what we wanted to see. As our time was limited, we had to fill a lot in one day and spent nearly 10 hours with him. As a native, it was interesting to gain knowledge and insight based on his life there. David was punctual, intelligent, engaging, humorous and was certainly proud of what he was showing us. We would highly recommend David as a guide for a Quito (or any Ecuadorian destination) tour. This was a great tour with David. He had so many interesting stories about the history of the city and the trip to the Equator. He also picked fantastic places to eat lunch as I am vegetarian. This was one of four tours I went on with him. I highly recommend David, you won't be disappointed. Our Quito city tour with David G was AWESOME. The guided tour experience is 80% about the personality of the guide. David is a fresh, personable, amazingly well-informed young man with a lively spirit. As a guide, he must tell the same stories a thousand times, and yet his delivery was charged with ENERGY and ENTHUSIASM on every single topic -- as if it were the first time. His fund of knowledge regarding every topic was astounding. His English is excellent. David is a TEN STARS guide ! David provided a very good and thorough tour of Quito. He arrived at our hotel on time. His car was clean and odor-free, and he drove very well. Most importantly, he speaks English fluently and is easy to understand. He is very knowledgeable of Quito - it's geography, history, and ecology, and he provided interesting anecdotes throughout the tour. I would highly recommend him to any first time visitor of this beautiful city. TOUR GUIDE RESPONSE: Thanks for the words Susan. I am glad that you enjoyed the tour. It was really nice to meet you. I wish you the best for the rest of your trip in Ecuador. Very good tour and tour guide. Would highly recommend both! We are very happy with our decision to have a tour and pick David. TOUR GUIDE RESPONSE: Thanks Matt. It was really nice to meet you guys. I appreciate the words of recommendation. Have a great time in Galapagos.